Manufacturer of a wide range of products which include fragrance display system rack stand. We plan and execute designs that provide a luxurious atmosphere for fragrance showrooms, which inspires customers to try out different scents.A feather touch of light modulation, accentuation of colors and selection of the perfect fixtures and furniture is extremely important. We provide our customers with essential tips and guidelines on the retail display modules while designing the store. Visual aesthetics are very powerful in the retail space. Our leading team of experts helps you choose the right color themes for the in-store. In the end, your color palette determines and communicates the tone and personality of your store. Display Furniture and Lights are crucial aspects of store designing. Our designers will study your brand & its featured products to work with you to select a suitable theme for your fragrance and perfumes store. Our team will help design and execute the furniture for your showroom, keeping in mind the look and feel that is suited to your brand but also is durable in the commercial environment. 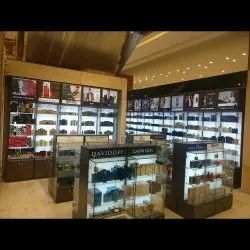 We also help you with Back WallDisplays & Mid Floor Displays for showcasing perfumes to ensure best use of the space provided. Looking for Fragrance Display Solutions ?